Letter: September 2013 | InterSolve Group Inc.
promoting... alliances, working with chief executives to assemble teams from diverse sources to create new business opportunities." Thank you, Ann. I am honored to be with such distinguished educators! My wife Sally and I have two children, both of whom are teachers, and both of whom are married to teachers – so we fully appreciate how many lives teachers touch! A principal value of The Children’s Adventure Garden is inspiring young scientists by integrating subject matter from various disciplines through the learning stations, with an emphasis on “discovering science by hands-on doing”, rather than simply reading about chemistry, biology, physics, or earth science and memorizing isolated facts. We all remember the joy and excitement of our own children receiving a microscope or telescope, or going to the beach for the first time, or, in our son’s case, keeping his collection of rocks and spare machine parts when he got married and moved away from home! We know project-based, self-directed learning is effective with emphasis on critical thinking, collaboration, and communication. First, America’s global competitiveness has been a keen interest of mine since the early 1990’s when I first focused on critical high technologies and strategic dependencies with one of our country’s leading industrialists. Continuing our leadership in computing and applied information technology. The Children’s Adventure Garden supports all these objectives since people are the only source of a sustainable competitive advantage – and all people start as children! Second, it is important that our emphasis on science, technology, engineering, and mathematics not crowd out our valuable heritage of world-class liberal arts education. The number of true liberal arts colleges – those in which over half of the students focus on the humanities – has declined in America from over 500 to about 125 in recent years, as many colleges have increased their courses in health sciences, business management, and technical subjects. The critical thinking, creative problem-solving, and elasticity for life developed through education in the liberal arts is envied by the world. Third, I am an advocate for “accidental education” and character that is acquired starting everyday at 4:00 P.M. through participation in amateur athletics and other extracurricular activities. It is critical that our youth and young adults simply have the opportunity to play! Education is a trillion dollar industry in America. Annually $500 billion is invested in K-12 and $500 billion in higher education, so $1 trillion combined. As the Under Secretary of Education for the United States, my role was managing the operating and investing integrity of about 10% of that $1 trillion or $140 billion of taxpayers’ new money provided annually by the Federal Government through the Department of Education. That’s $384 million every 24 hours, 365 days every year! Included in my responsibility was $400 billion of Federal Student Loans for higher education for 22 million customers. Those are big investments – the point is there is lots of capital available to the education industry! Yet, I have never seen a finer, more impactful investment in education than The Children’s Adventure Garden at the Dallas Arboretum! 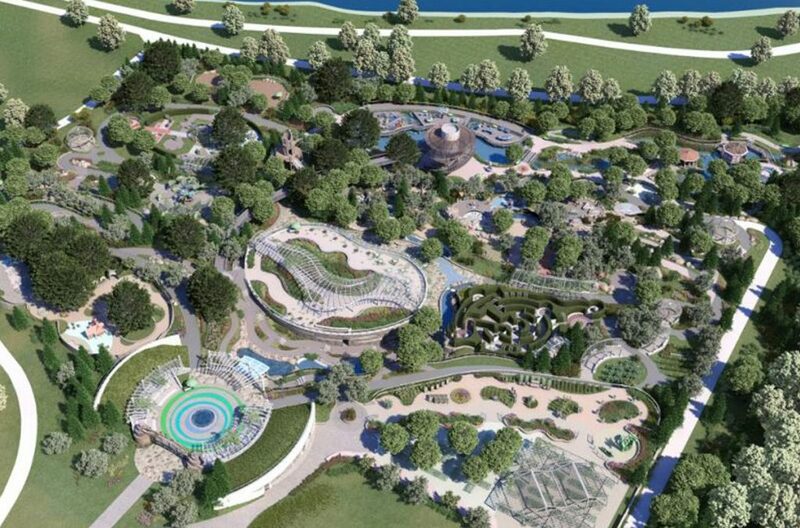 The Children’s Adventure Garden is clearly a gift to be treasured as a “Blue Chip Growth Stock” – and joins with one or two other enterprises as “the biggest thing in Dallas” since the Dallas/Ft.Worth Airport!